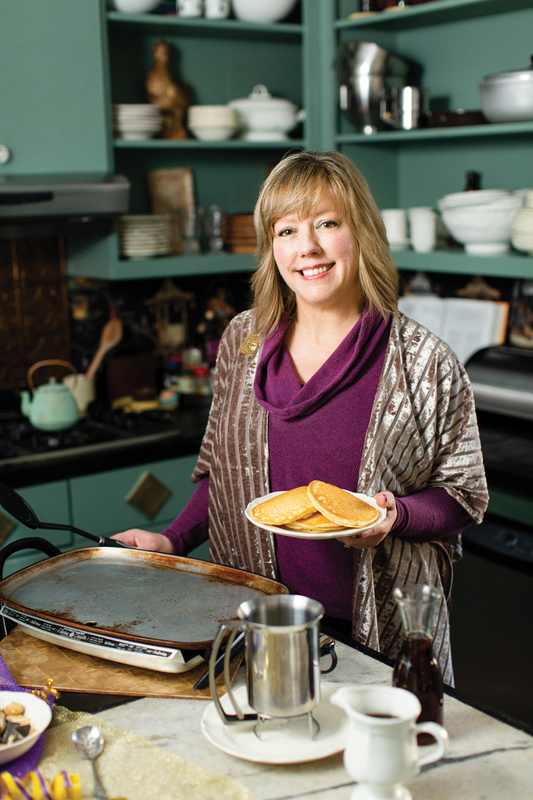 Renea Greene prepares hundreds of pancakes every year with the help of her handy pancake batter dispenser and her mother-in-law’s trusty griddle. Twelve years ago, Renea Greene, her husband, Doug, and children Laura-Hampton Sarah and Douglas, embraced both traditions and began a legendary party that their friends and family look forward to year-round. The concept is fairly simple. 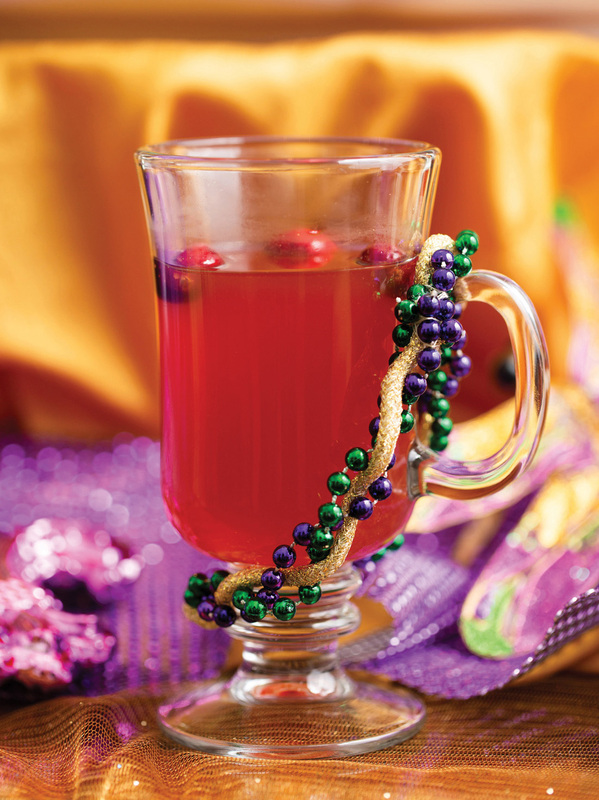 Green, gold and purple Carnival decorations set the scene, while the menu consists of several varieties of pancakes, Conecuh sausage, coffee, orange juice and this year’s newest addition, Bon Temps Hot Cider. 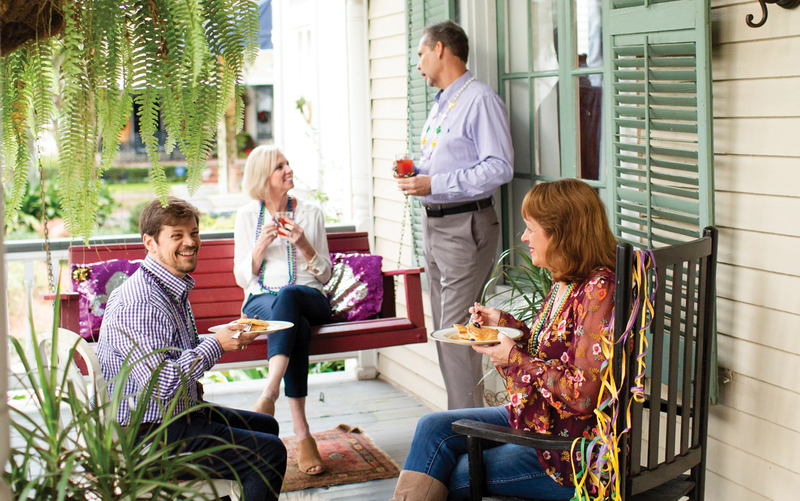 Guests chow down and mingle on the porches of the Greenes’ historic home before walking down to the parade routes to catch umbrellas full of baubles. Bruce Rockstad, Kim Lowe, Ricky Bradford and Rosemary Williams enjoy the revelry. 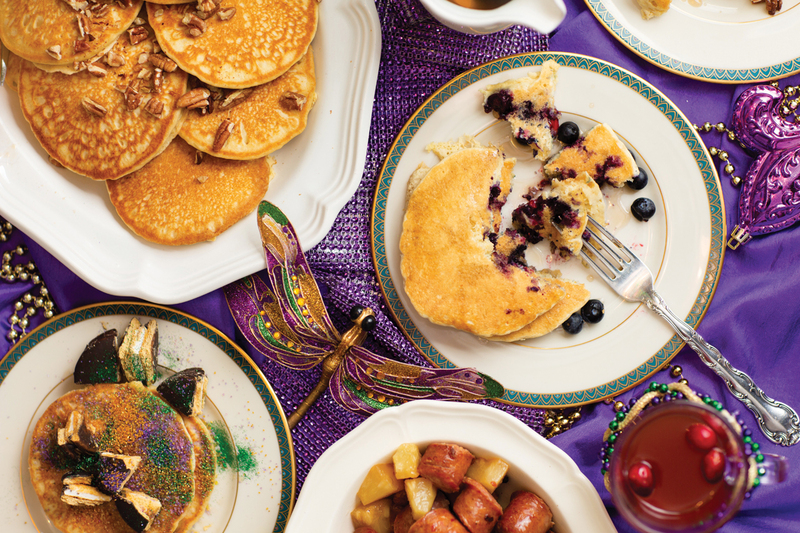 On Fat Tuesday morning, as the sun’s first rays glisten against the beads dangling from age-old oaks, Renea loads up her double ovens. 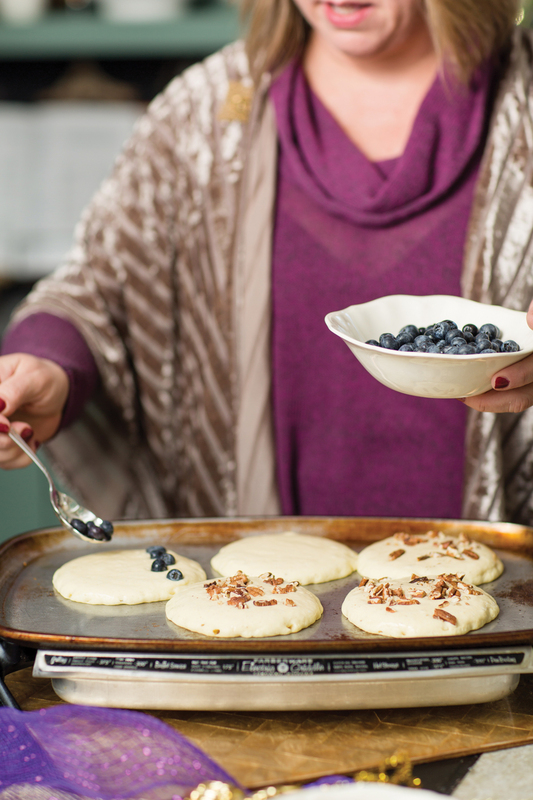 She slowly warms up hundreds of make-ahead blueberry, pecan and old-fashioned buttermilk pancakes. And then, there are the kids’ favorites, MoonPie pancakes, which require plenty of colorful sprinkles. “Some guests come, eat and hurry on their way to catch the Athenas parade, while others stay around, relaxing and visiting,” says Renea. “The laughter, conversations and excitement over the fun to come remind us why we do this year after year.” Laissez les bons temps rouler! 1. In a large bowl, whisk together eggs, buttermilk, butter and vanilla. 2. In a separate bowl, mix the flour, baking powder, baking soda, salt and sugar, blending well. 3. Add dry ingredients to liquid ingredients, whisking until combined. At this point, add buttermilk or flour as necessary to adjust the thickness of the batter as desired. 4. Preheat a griddle to 375 degrees, or medium heat. Electric griddles provide the advantage of heating quickly, reduce the need for oil and can reach the proper temperature while you are preparing the batter. When your batter can pour easily, lightly spray the griddle with canola oil for crunchy edges. Use a ladle or pancake batter dispenser (I highly recommend this tool if you are cooking for a large group). You can also use a container with a lip. 5. Ladle or pour the batter onto the griddle. Pour a slightly smaller circle of batter than desired to allow for expansion. Once small bubbles form on the pancakes, they are ready to be flipped. Cook on the second side until pancakes are browned underneath. Serves 20. Tip: Serve pancakes immediately with butter and your favorite syrup, or store covered in a cool oven and reheat slowly, starting at 200 degrees and gradually increasing to 300 degrees, before serving. 1. Prepare the pancake batter. 2. Chop pecans into small pieces. Spread onto an aluminum foil-lined baking sheet and toast pecans at 375 degrees until they are golden and glistening, about 5 minutes. Watch carefully. The pecans are usually ready when there is a nice aroma. Remove, let cool a bit and pour pecans into a bowl. 3. When pecans are slightly cooled, dispense pancake batter circles onto the griddle. Sprinkle the toasted pecans onto each pancake. Sprinkling pecans works best with the batter dispenser, as the pecans tend to clog the nozzle. If you are ladling the batter, you can add pecans directly to the batter. When bubbles start to form, flip the pancakes for a couple minutes more until golden brown. Serves 20. 1. Prepare pancake batter, adding cinnamon to the dry ingredients. 2. Chop MoonPies into bite-sized chunks. 3. Pour pancake batter circles onto griddle. 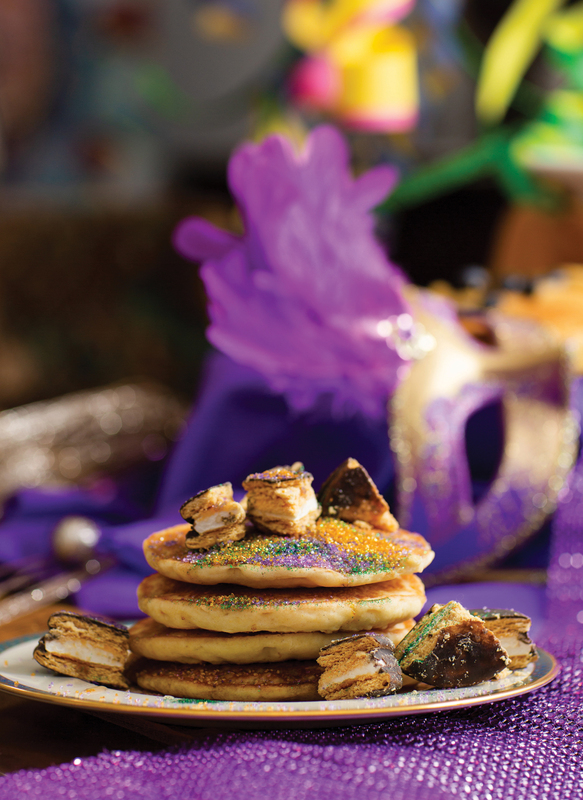 Sprinkle several MoonPie chunks onto each pancake. Wait for bubbles to form and flip pancakes. 4. Immediately, sprinkle edible glitter onto each pancake. Cook until golden brown. Serves 20. 2. Wash and dry blueberries, checking for and removing stems. 3. Dispense pancake batter circles onto griddle. Add blueberries, right on top, to each pancake. Wait for bubbles to form, flip and cook until golden brown. Serves 20. 1. 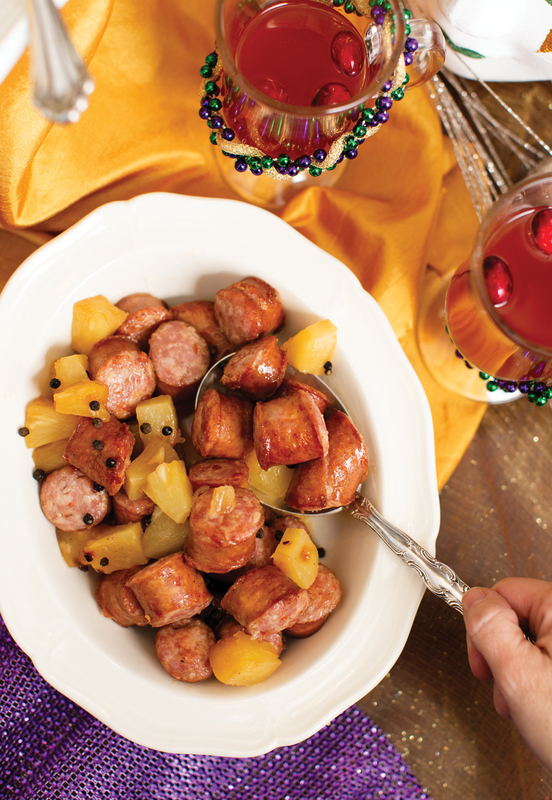 Cut Conecuh sausage into bite-sized chunks and brown on medium-high heat in a skillet with olive oil and butter. 2. Add pineapple juice and white wine. Cook, rolling sausages in skillet, until the liquids thicken and sausages are glazed and browned, about 15 minutes. Transfer sausages to a warm platter. 3. Add pineapple to skillet in a single layer. Sprinkle with salt, peppercorns, crushed red pepper and brown sugar. Cook 3 – 4 minutes, turning to coat, and brown the pineapple until hot and caramelized. Pour over sausages and serve. Serves 12. 1. Pour apple cider, cranberry juice and grapefruit juice into a pot. 2. Add cloves and star anise to a muslin bag (or cheesecloth) and place in the pot. 3. Add cranberries. Bring to a boil, then simmer for 15 minutes. Remove spices. Pour into mugs, dividing the cranberries evenly. Serve hot. Serves 10 – 15.